NOTICE: Requires the base game Galactic Civilizations III in order to play. Activation key must be used on a valid Steam account. Requires internet connection. About the gameThe human race is fighting a desperate war against the remorseless Drengin Empire. 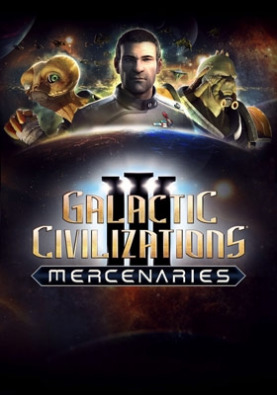 Both sides have become increasingly desperate, leading them to turn to the galactic underworld and their elite mercenaries.In Mercenaries,… the first expansion to the acclaimed Galactic Civilizations III game, new opportunities open up across the galaxy in the form of Galactic Bazaars. When you discover one of these hidden establishments, you can choose from a long list of hired guns and pay a mercenary to take care of business for you. Each mercenary has their own unique ship and provides various services. Want to improve a planet? Some mercenaries will boost your economy, technology, or construction. Find a dangerous anomaly you don’t want to risk life and limb over? Pick a combat mercenary suited for the job and send them to do your bidding. Your bones are fragile, after all.With a new campaign, factions, abilities, tech trees, music, and more, Mercenaries is a must-have addition to your Galactic Civilizations III experience. Key FeaturesGalactic Bazaar Visit the Galactic Bazaar and choose from dozens of mercenaries for hire and use them to improve your planets or send them on missions to fight enemies or survey other planets and anomalies.New Ships and Ship Parts Every mercenary has their own unique ship for traveling across the galaxy. There are also dozens of new ship parts to allow for more customization. Check out the ship editor and enjoy all of the new possibilities for design.New Faction - Arceans	Play as an ancient and honorable civilization of warriors and long-time enemy of the Drengin Empire. Making their first official appearance in Galactic Civilizations III, the Arceans have new racial traits, abilities, and tech trees.New Faction - Torians Play as an old familiar race from Galactic Civilizations II! The Torians are an aquatic species who seek to escape the slavery of the Drengin Empire. They are at the center of the campaign and come with new racial traits, abilities, and tech trees.New Campaign	No one likes being farmed for meat. The Torians have had enough! Hire mercenaries and lead the Torians to freedom from their Drengin oppressors. Rebuild your shattered empire from the ground up and thrive in the face of adversity. System Requirements Windows - Minimum Operating system: 64-bit Windows 8.1 / 8 / 7 Processor: 1.8 GHz Intel Core 2 Duo / AMD K10 Dual-Core Memory: 4 GB Hard disk space: 12 GB Video: 512 MB DirectX 10.1 Video Card (AMD Radeon HD5x00 Series / Nvidia GeForce 500 Series / Intel HD 4000 or later) Sound: DirectX Compatible Sound Card DirectX®: 10.1 Windows - Recommended Operating system: 64-bit Windows 8.1 / 8 / 7 Processor: 2.3 GHz Intel Core i5 Processor or Equivalent Memory: 6 GB Hard disk space: 15 GB Video: 1 GB DirectX 10.1 Video Card Sound: DirectX Compatible Sound Card DirectX®: 10.1 © Stardock Entertainment. Galactic Civilizations is a registered trademark of Stardock Entertainment. All rights reserved.